This section of the web site contains information to make it easier to choose the chemical with which to worm the horses or ponies in your care. The advice will help you select the most effective combination of wormers and appropriate treatment intervals to reduce or eliminate the worm burden in your horse or pony. If you need to use these pages then you should consider a MOT of your worming programme. Most horses with worms today are on a worming programme, it just isn't the right one for them and isn't working. The Worming MOT has been developed to solve the complexity of worming today. A potential client called in recently and advised us that she was already doing everything that she should be, and couldn't see why she needed our services. Later in the conversation she admitted that she still had worms in the environment and asked why would we be able to suceed where she couldn't. She had done her research and was doing everything as recommended in the many information sources available. The answer is applicable to everyone using these pages. Our consultants have spent eight years researching parasites, and nothing else. All of our procedures are based on the research and findings of veterinary parasitoligists. We read all papers published on parasites and have relationships with every pharmacutical company manufacturing wormers. We know exactly how each chemical used in wormers really works and when it will not work. We have carried out our own many trials over the last eight years and that is why we can make a difference to your worming programme. However, if you still wish to take a DIY approach then we have the following information sheets to guide you. Please note before you continue that we accept no liability for the failure of your worming programme if you do not wish to request a worming MOT. "Why do I need to change wormers?" There are many strains of worms that have developed a resistance to certain chemicals and so it is crucial that if you are using chemicals to worm your horses that you understand how to test for this and also how to slow down the development of drug resistance. Start with this information sheet as it shows the factors you should consider when selecting your worming strategy, worming program or wormer. This table shows all of the worming products licensed for use on horses in the UK grouped by the active chemical compound contained in each wormer. It shows the recommended treatment intervals. This table provides the answers to any questions you many have regarding the chemicals used in wormers. If you want to know which wormers have the same ingredient, the period of coverage or the worms that each chemical treats then all the information that is common to a chemical is contained in this table. This help sheet outlines the different worming strategies that you may choose. We do not publish standard worming programmes any more as this goes against current veterinary recommendations. If you would like to enquire about your particular situation then please contact us by email with further details. This help sheet outlines how you can help stop the worms in your horse developing resistance to the four chemical ingredients. The most common questions that you might have are answered in this section. We have developed information sheets on most worms that your horse or pony may be carrying. A worm egg count is recommended between May and August, when you are due to worm, in order to monitor the effectiveness of your chemical worming program. However worm egg counts can be very dangerous if interpreted incorrectly. We have developed information sheets on most worms that your horse or pony may be carrying. Many horse owners underdose due to not knowing their horse's weight accurately. The effect of this will make the wormer ineffective, cause a high worm burden despite regular worming and may cause worm resistance to chemicals. 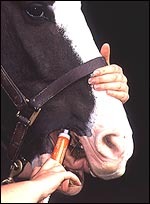 For example one syringe of Equest is not sufficient for the average 15.3hh plus horse. You can order a weigh tape from our shop to make sure that you are giving the correct dosage to your horse or pony.